Chicken Hazaarvi recipe by Nazia Nazar at DesiRecipes.com. Chicken pieces dressed in cream, cheese and aromatic spices. Cut chicken breasts into twoinch cubes. Apply ginger paste, garlic paste, white pepper powder and salt to the chicken cubes and keep aside. Mash the cheese to make it into a smooth paste. Add Finely chopped green chillies, mace powder, nutmeg powder, coriander leaves and salt . Add egg and mix well. Add chicken to the cheese mixture. Then add fresh cream and mix delicately. Keep in the refrigerator for about two to three hours. 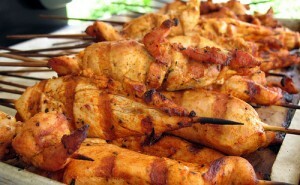 Put chicken onto the skewers and cook in a moderately hot tandoor or a preheated oven (200 degrees Celsius) until it is just cooked and slightly coloured. Apply a little butter for basting and cook for another two minutes till chicken is fully cooked.